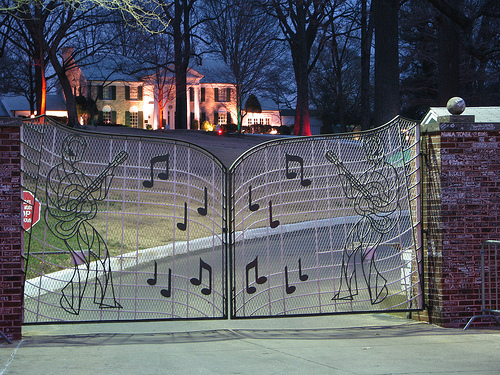 The Gates Of Graceland. the gates of graceland. Wallpaper and background images in the एल्विस प्रेस्ली club tagged: gates graceland elvis king music image photo. This एल्विस प्रेस्ली photo contains ज़ंजीर से बंधी बाड़ and chainlink बाड़. There might also be सड़क, शहर के दृश्य, शहरी सेटिंग, शहर दृश्य, and शहरी की स्थापना. Elvis, Vernon and Gladys Presley in front of their घर in Audubon Drive, 1956.